Our common love of good food is one thing that attracted Michael and I to each other, and if we had to give one dish credit for getting us cooking together, it would have to be pizza. Both of us have been making pizza since before we ever knew each other. I had experimented with cracker thin crusts, and Michael played with deep dish and Chicago-style stuffed pizzas. When I saw his authentic well-seasoned deep dish pizza pan, I decided this was a man I wanted to get to know better. And Meyers Family Pizza Night was born. Our boys have grown up making pizza with us, first just helping sprinkle on toppings, then graduating to mixing and shaping dough. It’s probably our favorite meal each week, a Friday night tradition that brings us all into the kitchen together. 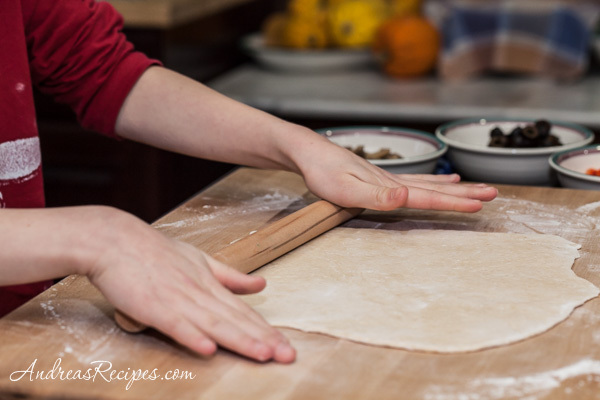 And this year our oldest son started learning how to toss dough, adding even more fun to our pizza nights. We constantly vary our toppings and change it up each week, but I would have to say that a mixed vegetable pizza and a pepperoni pizza with a full-flavored sauce made with McCormick spices are the favorites for our boys. 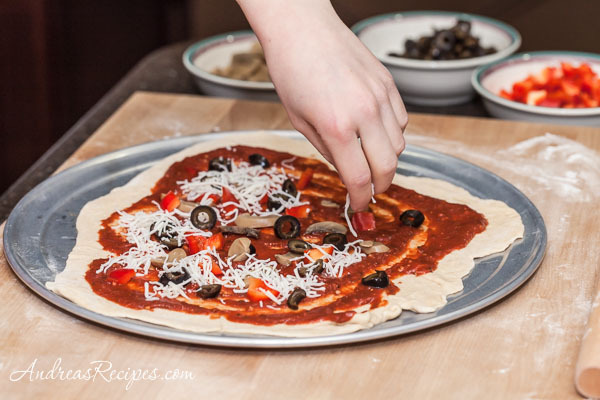 Even on busy nights, we can still whip up pizza with homemade pizza sauce in about 45 minutes with quick whole wheat pizza dough. And no matter what dough we make or toppings we choose, we still enjoy the good food we made and the time spent together. That’s our American Homemade story. 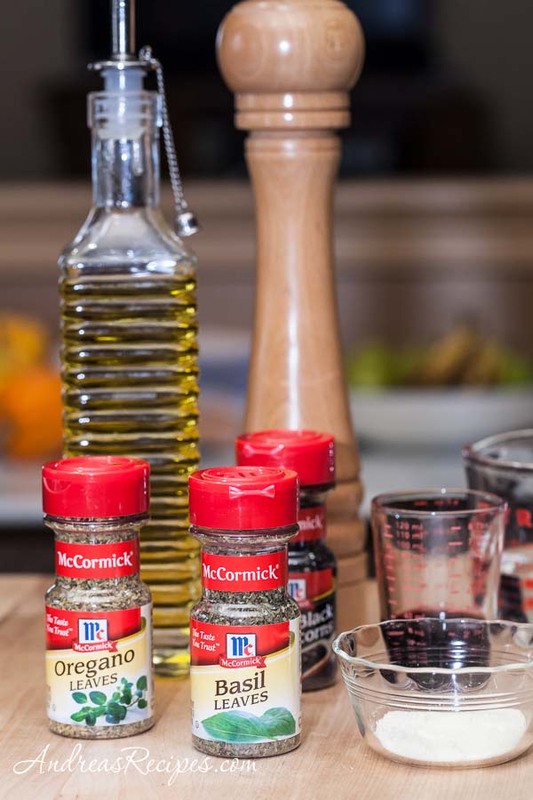 I’m working with McCormick.com to share the love of homemade food, and you can share your stories, too. What’s your family’s favorite meal to make and eat together? 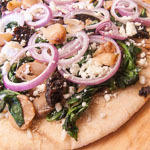 We are adventurous eaters and enjoy making all kinds of food together, not just pizza, and I sometimes use McCormick’s new FlavorPrint tool to get ideas for planning our weekly menu. FlavorPrint is very easy to use, I just answered a few questions about my favorite foods and flavors, and it suggests recipe ideas based on things I like. Give it a try, it’s a great help for meal planning. And then get everyone in the kitchen and cook together! Place oven racks in the top and bottom thirds of the oven. 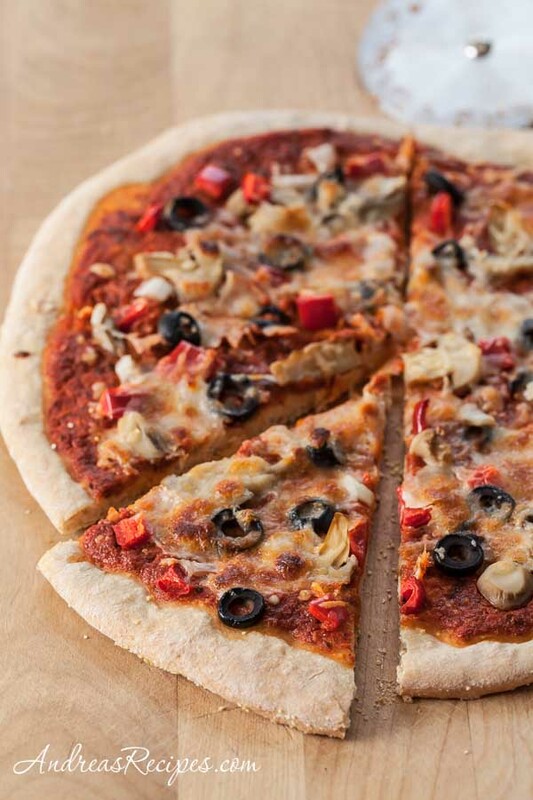 Preheat the oven to 425°F/220° C.
DOUGH: While the oven heats, prepare the Quick Whole Wheat Pizza Dough. SAUCE: While the dough rests, warm the extra virgin olive oil in a 1 quart saucepan over medium heat. Add the garlic and sauté just until fragrant, about 30 seconds to 1 minute. Add the tomato sauce, wine, sugar, McCormick Oregano Leaves, McCormick Basil Leaves, and parmesan cheese. Stir well and cook until the sauce is hot, about 5 minutes. Stir in the McCormick Sea Salt and freshly ground McCormick Whole Black Peppercorns, and cook 1 more minute. Remove from heat. For two medium pizzas, divide the dough in half. Roll out one dough ball into a 12-inch circle on a floured surface. Sprinkle coarse cornmeal on a pizza pan, and transfer the dough to the pan. Ladle half of the sauce on the dough and spread evenly around the surface. Sprinkle on the vegetable toppings, followed by the cheese. Repeat with the remaining dough, sauce, pepperoni, and cheese. Place pizza pans in the oven, one on the upper rack and one on the lower rack. Bake for 10 minutes, and then move the bottom pizza to the upper rack and the top pizza to the lower rack. 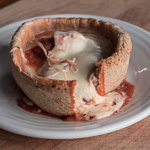 Bake until the crusts are lightly browned and the cheese is bubbly, about 10 more minutes. Remove from the oven and allow to cool 1 to 2 minutes, then slice and serve. The pizza sauce and dough can be made a day ahead. For one large pizza, use a larger pizza pan, 14 to 16 inches. You can also bake the pizza on a pizza stone. Preheat the oven to 500° F/260° C, and bake the pizzas directly on the hot stone or on parchment laid on the stone, about 15 minutes. 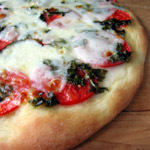 Assemble the pizza on a pizza pan or pizza peel, and transfer to the hot stone for baking. Look at him go, flingin’ that dough so expertly into the air! Thanks Glyn, he has fun throwing pizza dough. This looks simple, straightforward and easy! I cannot stand the sauce from a jar. I want to try this but is there a substitute for the wine? I cannot have alcohol …even in cooking (I realize it burns off but still cannot have it). Any substitutions you can offer or just leave it out? I would love to make it with my daughter!